In this study we perform the first econometric attempt to estimate the trade-off between equity and efficiency of tax systems counting for the tax evasion option in a developing country such as Albania. Using the Albanian Living Srandard Measurement Survey (2005, 2008) we estimate a micro-econometric model of labour supply and incorporate the option of participation in regular and irregular labour markets. 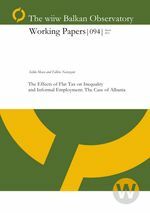 Swapping the tax rules of 2005 with 2008, we find that the flat tax has not contributed in the reduction of labour informality but rather the increases in regular wages have played an important role in convincing the individuals to move to regular market. Furthermore, we find that controls and audits are more efficient than fines in inducing people to switch from the informal to formal labour market. A similar effect is achieved also when “honest” individuals are endowed with a universal benefit. In distributional terms, calculations of Gini inequality index and Sen’s welfare index demonstrate that the only scenario that would improve welfare index is a progressive tax rule as before 2007. Finally, these results suggest that a kind of progressivity should be reinserted to the taxation system without affecting the attractiveness of the simplicity exercised by the flat tax.